Today is the day of the patron saint of the Land of Song. If patrons matched their countries he should be known for his music, but patron-sainthood is bestowed by historical accident rather than logic. David seems to have been famous for preaching, founding a monastery and being a bishop. Actually not much is known about him, but the National Museum of Wales has an article I found interesting. When I was living and working in Wales our canteen used to serve a special meal of cockles, laverbread (a kind of seaweed) and bacon. We all ate it and thanked the cook for it, but I can’t recommend it. The little girls wear their national costume to school, but I don’t think the boys have one. I haven’t sounded off about men’s lib on this blog before, but I think clothing is one area they need it. Why don’t the boys have something special to wear for the special day? Do they mind taking second place to their sisters? 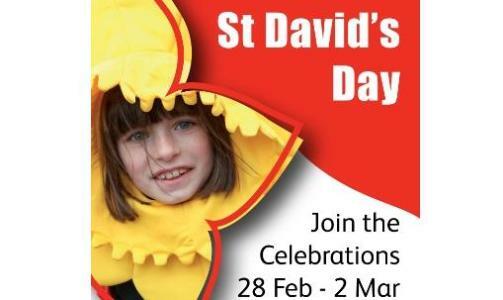 I took the picture from the Visit Cardiff website which advertises a parade another chance to dress up, for adults and children, at the St David’s Day parade. Good point. Why don’t the guys have something to wear, too? Thank you for stopping by and commenting. It’s great to hear from like-minded people.